A scratchy and fractured psychedelia runs across an even-tempered array of petri-dish experiments in Twice the first time by Ross Taylor. Consisting of two sub-suites of pencil drawings in classical genres – landscape and still-life – this exhibition of pencil drawings blends historical references, contemporary documentation and improvisation. It is with an even-hand that Taylor balances a set of variant approaches in the production of his work. Driven by a specific and refined process-oriented motivation he works with vigour to generate a body of work rich with interior and exterior character. 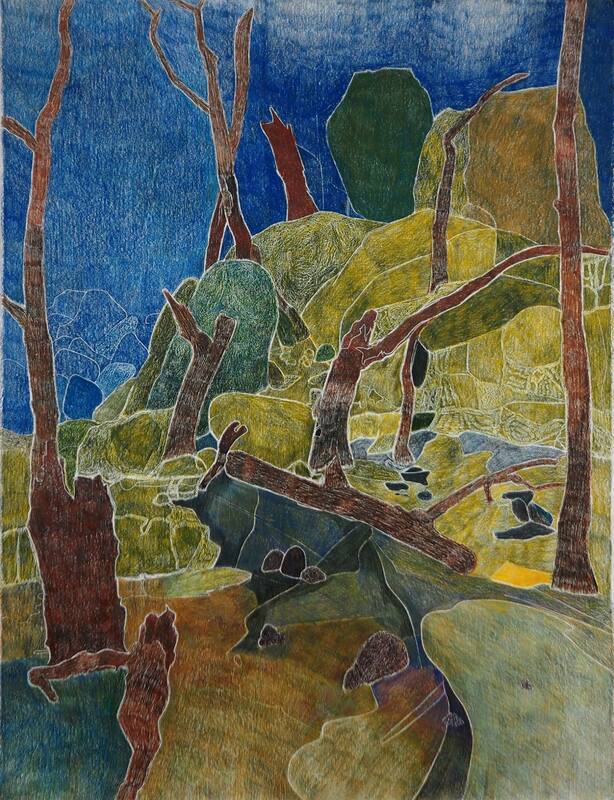 Taylor’s suite of drawings evoke early modernist connections, particularly his landscapes, where the ghosts of Grace Cossington-Smith and Roy de Maistre are eery spectres in the bush, not so far from the haunting allusions to Hanging Rock which sits only a few kilometres from where Taylor has drawn his source inspiration in the Macedon Ranges. But in combination with his still-life drawings of vases, with their evocation of ceramics’ current trending contemporaneity, there is an almost digitally influenced immediacy. His treatment of the vases as isolated objects floating free in a white void of non-history renders them both past and present, a grappling engagement with Greek urns on the one hand and Instagram platform sharing on the other. It is the process itself which holds the key to unlocking the work’s most interesting elements. Taylor draws the imagery on to the paper invisibly at first, working over it later with coloured pencils. This transforms the intention and the accuracy of the original image while simultaneously revealing it as white lines within the overlaid drawing. The invisible under-drawing cannot be corrected and it remains an element of the final outcome, a form of blind scaffolding around which the final composition must stand. The outcome both subsumes its initiation and reveals it on its surface. Of course, it is the imagery itself which sets the primary interaction in the consumption of the work. And it is landscape and the treatment of the environment that leaps out of the work most visibly. Taylor captures a certain uncanny disorientation that is a character of the bush in much of Australia. Where colour is freed from its realist association to object and perspective is untethered from orientation, the works most successfully assert their strength. The landscape is wilful and subject to subterranean and subconscious forces that propel its energy, and in works like Black Hill no.3 (Half wooded downs) and Black Hill no.2 (Verse for a grieving light) this is most effectively and poetically achieved. The vases speak of landscape extracted, implying the further fragmentation of the botanic living energies from their original source and their severed, cut and clipped conversion to vessel confinement inside our homes and workplaces. Taylor renders each vase with a facade of landscape, echoing the home from which their implied contents will have been drawn. And in perhaps the most energetically captivating work from the show, Settlement, he pulls all of the elements together to produce a work that is at once landscape, still life and meditation on contemporary life’s unhinged discontent between our inner and outer worlds. Tags: Ross Taylor, Stockroom Gallery. Bookmark the permalink.